Get The Best Hair You Well Ever Purchase HERE! Madison Reed is revolutionizing every aspect of the at-home hair color experience. Madison Reed starts with ammonia- and resorcinol-free professional grade products that are used in salons and delivers them to your door. Still afraid to color your hair at home? They’ve developed entirely new ways of finding your perfect permanent hair color – choose from an online color advisor, mobile app, live web chat, digital photo consultation or speak to a trained colorist on the phone. All of this is what makes the Madison Reed “in-home” coloring experience superior to the traditional way of coloring your hair at home. Madison Reed is turning quite a few heads in the beauty world, too – take a look at what Vogue.com had to say about them. Expert Advice: Get free professional consultations from the experts on our Color Crew. Salon-Quality Results: Our multi-tone formula is ammonia-free and creates dynamic, natural shades for sophisticated color at home. Shine On: Rejuvenate your hair with our gluten free, paraben free and sulfate free, nourishing shampoo and conditioner. 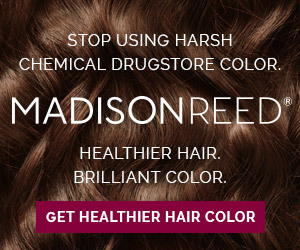 Convenient Delivery: Madison Reed’s hair color is delivered to your doorstep on your schedule. Set up auto-delivery and always have a kit ready when you need it. A Gift with Every Purchase: Yes, that’s right. There is a QR code you can scan for a free gift inside every box. What are you waiting for? Now is the perfect time to try Madison Reed’s amazing hair color! Save 50% off your first order at Madison Reed – just use the offer code LAZYDAYS at checkout. Amber Rose Shows Off Her Buzz Cut… Do You Like It? 08 Oct 2013 Comments Off on Amber Rose Shows Off Her Buzz Cut… Do You Like It? Rihanna didn’t like that so much and had to remind Karrueche, Us and Chris Brown who his favorite girl was by putting up this picture Saying Your Fav! It’s Sunday and you’re talking s—? Give yourself a break! Why are You Straightening Your 5 Month Old’s Hair? 14 Aug 2012 Comments Off on Why are You Straightening Your 5 Month Old’s Hair? The Rules About Licensing for Hair Braiding Are Shifting Across the U.S.
14 Aug 2012 Comments Off on The Rules About Licensing for Hair Braiding Are Shifting Across the U.S.